This is an open mic jam, hosted by Richie Cannata (sax player with Billy Joel). Also joining us on stage is Tommy Bowes (Vocals), Kevin Bregande (Drums), Jim Moran (Guitar), George Panos (Bass), Mark Bonder (Keys) and Fred Walcott (Perc.). 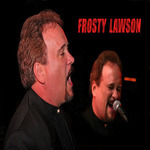 Frosty has been playing with Richie on this jam EVERY MONDAY NIGHT for 12 years! Come on down, sign up, and we'll get you on stage to jam with us! If you can't make it down, check us out on the live video stream at: www.bitterend.com.